A holiday to the Timbavati Private Nature Reserve is the ideal way to recharge and rejuvenate the soul. There is very little in our opinion that top being in the bush. We’re put together a Kings Camp daily itinerary so you know what to expect during your stay. The day starts with a chipper phone call from your ranger at 05h00 in summer and 05h30 in winter. As the sun rises slightly later in the winter months, you can enjoy an extra 30 minutes of beauty sleep before your wake up call in winter. Meet your guide in the library for a quick cup of tea or coffee to wake up before you depart for your drive. Wildlife is often more active before the heat of the day, so it’s prime time for some of the rarer sightings. In winter, be sure to wear warm layers on your morning game drive. Kings Camp’s experienced trackers and guides will keep you entertained with their knowledge and expertise and some incredible wildlife sightings. A highlight of the morning game drives is the hot chocolate and Amarula stop. Having worked up an appetite, you can now take full advantage of the mouth-watering cold meats, pastry and fruit buffet before tucking into a tasty cooked breakfast. During the time between your scheduled activities, you can relax and soak up the African bush and enjoy some game viewing at the active waterhole in front of the camp. A range of pampering spa treatments can also be enjoyed in the Kings Camp Spa or in the privacy of your suite. Sit down to a scrumptious lunch overlooking the Timbavati bushveld. 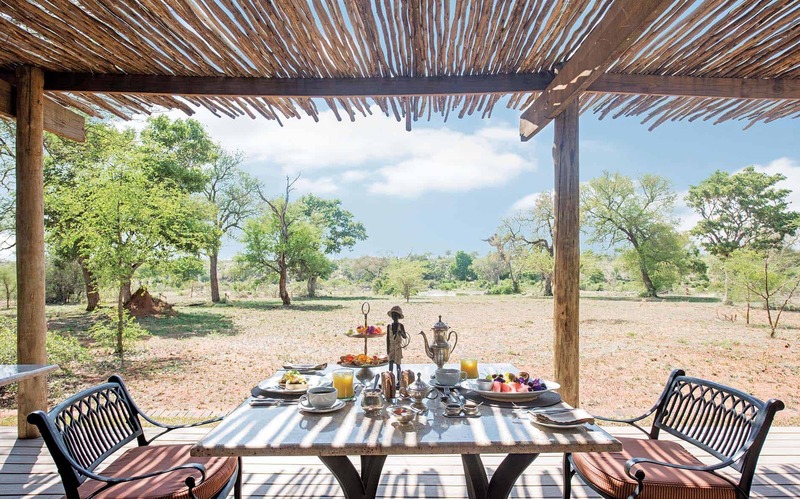 The dining verandah overlooks the Kings Camp waterhole which is frequented by herds of elephant and buffalo. 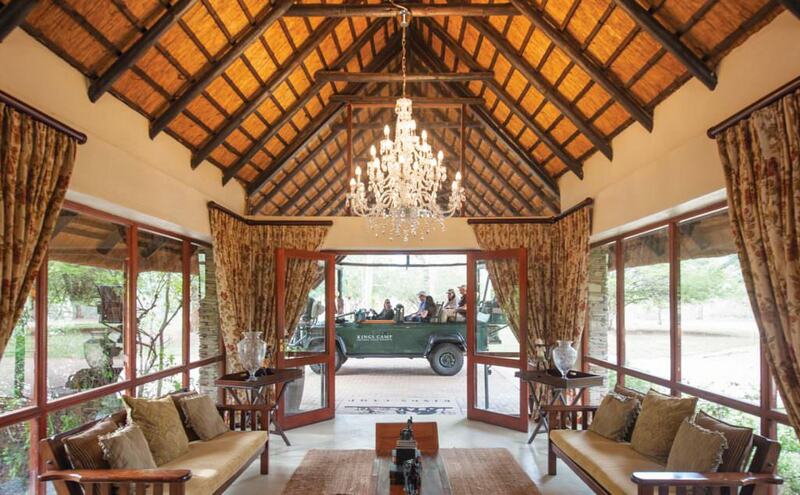 Join your guide in the library for a cup of tea or coffee before your afternoon game drive. Make sure you pack some warm clothes for after dark, as the temperature is likely to drop in winter. If you’re unsure of what to wear, take a look at our safari packing list here. Settle into a seat on our game viewing vehicles and enjoy an afternoon of wildlife spotting accompanied by your expert guide and tracker. Sip a G&T and snack on South African favourites like biltong, nuts and dried fruits while you watch the sunset over the expansive landscape. Game drives return to camp between 18h30 and 19h00. Just enough time to freshen up before dinner or a refreshing drink at the bar. End the day with an exquisite fine dining feast. 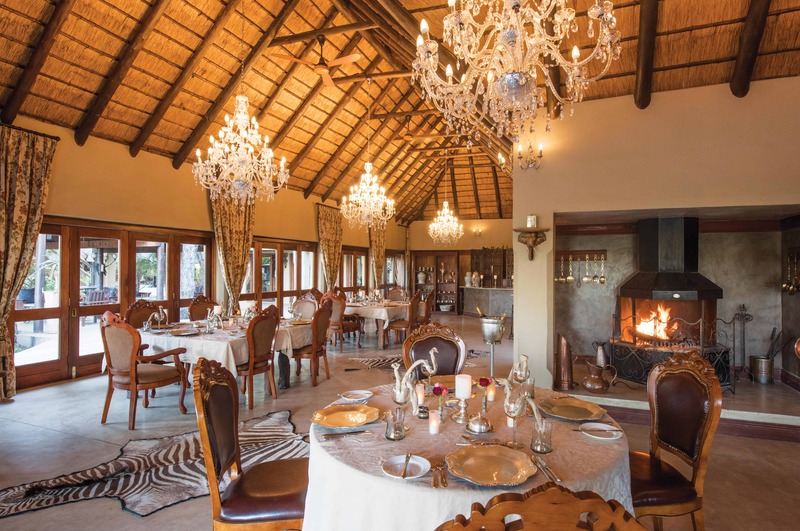 The atmospheric dining room at Kings Camp, lit by chandeliers is the ideal venue to spend an evening in this one-of-a-kind location. Enjoy mouth-watering cuisine paired with good South African wine and great company. If you’re celebrating a special occasion, a private dinner can be organized in the comfort of your suite. 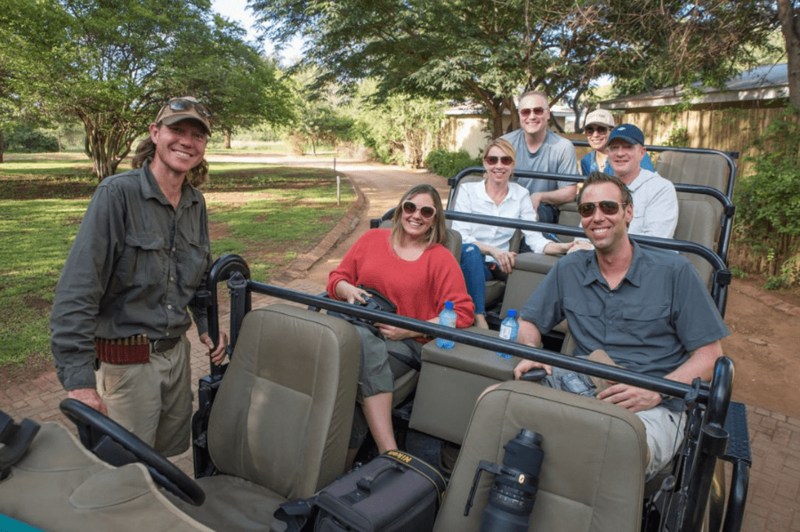 Ready to start your Timbavati safari? Take a look at one of our exclusive packages and experience more of what Seasons in Africa has to offer. Contact our friendly reservations team to find out more today.